Heading Out: Day 1 - Just south of Squaw Canyon Creek. Eric dropped me off at the trailhead at 6:08 which was a good thing since it was gonna get hot, hot, hot. Fortunately the trail, while climbing most of the morning, was generally shaded so I didn't have the hot sun to contend with on top of the hot air. Of course as I climbed it got cooler and there was a sometimes breeze. Nice for keeping the skeeters and face gnats away. It always seems to be about water and timing. My first water spot was Fall Creek, 5 miles into the climb and it was there I had to make a decision. 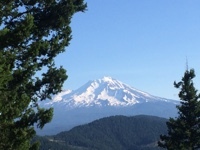 Would I water all the way up, meaning 3-4 liters, and dry camp for the night at around the 12 mile mark, or would I just get two and take a long break at noonish and walk to the next water source at 16 miles in. As I was feeling strong I decided to carry less and see how it went. I rolled into the 11.5 mile camp spot, dog tired, hot and hungry. 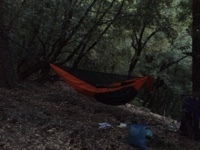 I put up my hammock in a perfect spot and after eating I laid down to rest up through the hot part of the day. What a fabulous idea! I was able to stretch, rest and by the time 3pm came I was ready to go again. I suppose I could have just stayed put but I'd have to go light on drinking water which isn't a good thing to do in this heat. Hydrate, hydrate, hydrate! Another plus for moving along was that, even though I was adding a bunch more miles to my day, all those miles were downhill. Unfortunately I forgot that as one loses altitude, it gets hotter. My lunch stop was at 4,500 and my target spot of Squaw Valley Creek was at 2,800. Big difference. But, I was committed so away I went. Early morning shot...a bit dark. I had hoped to find some likely looking trees near the creek but no matter how hard I tried there were none to be found. Nemo had mentioned that there were campsites "past the bridge", which I took to mean cross over the bridge and they'll be some campsites. Nope. Not a one. What I guess he meant is before crossing the bridge there was a trail that headed out to a trailhead. I guess that's where I was supposed to go. Instead I began climbing up, in the sun. A bit disheartening to say the least but there was nothing for it but to keep on, hoping to find some likely trees. Finally after about another mile I snagged some trees and hung my bed. I hung my food in the hope that critters won't get it, and parked myself in this cozy bed. I actually can't leave this spot as just on the other side of the nylon hammock are hordes of hungry, buzzing blood suckers. They are loud. I hope I don't have to pee anytime soon.